Public institutions are now devoted to serving their own vested interests or the interests of private financial Elites. Though we may think of collapse in terms of ATMs not working and rampaging mobs, collapse actually starts with the intangible loss of faith in public institutions: elected officials, law enforcement, the justice system and the agencies of financial regulation (anti-trust, etc.). “Americans’ confidence in most major U.S. institutions remains below the historical average for each one,” a Gallup spokesman said in a news release. All in all, it’s a picture of a nation discouraged about its present and worried about its future, and highly doubtful that its institutions can pull America out of its trough. The terms of the TPP and the TiSA are so secret that drafts of the negotiations are to remain classified for four years or five years, respectively, after the deals have been passed into law. How can laws be enforced against people and governments who are not allowed to know what was negotiated? If the Trans-Pacific Partnership is so good for the average American, then why not let us read it and be persuaded by the document itself? Instead, the vast machinery of the American central state is devoted to maintaining the secrecy of the bill and crushing all opposition with threats that are no longer even veiled. One of the 39 senators who voted against the TPP, Jeff Sessions, concluded "They Won The Vote, But Lost The Trust Of The American People"
Americans increasingly believe that their country isn’t serving its own citizens. They need look no further than a bipartisan vote of Congress that will transfer congressional power to the Executive Branch and, in turn, to a transnational Pacific Union and the global interests who will help write its rules. The same routine plays out over and again. We are told a massive bill must be passed, all the business lobbyists and leaders tell how grand it will be, but that it must be rushed through before the voters spoil the plan. As with Obamacare, the politicians meet with the consultants to craft the talking points—not based on what the bill actually does, but what they hope people will believe it does. And when ordinary Americans who never asked for the plan, who don’t want the plan, who want no part of the plan, resist, they are scorned, mocked, and heaped with condescension. Washington broke arms and heads to get that 60th vote--not one to spare--to impose on the American people a plan which imperils their jobs, wages, and control over their own affairs. It is remarkable that so much energy has been expended on advancing the things Americans oppose, and preventing the things Americans want. No wonder Americans have lost faith in their institutions: those institutions are now devoted to serving their own vested interests or the interests of private financial Elites. This same loss of trust is underway in Europe. 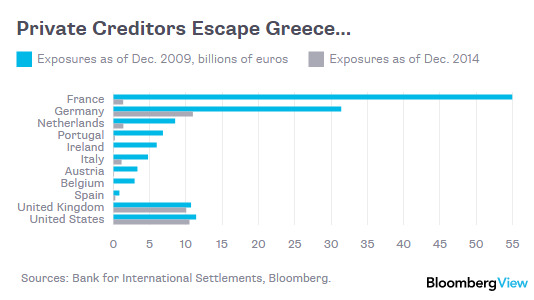 The entire Greek debt issue could have been resolved with fewer losses and much less suffering if Greece had defaulted on the private bank debt in 2010. 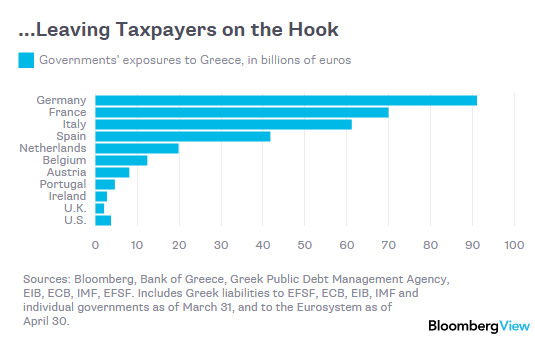 But with the complicity of the public institutions that were supposed to serve the citizens' interests, private banks quickly shifted the vast majority of the Greek debt to the taxpayers: If Greece Defaults, Europe's Taxpayers Lose. When institutions serve the interests of the few at the expense of the many, democracy is just a label slapped on financial totalitarianism. In case you missed it, here is Smith's Neofeudalism Principle #1:: "If the citizenry cannot replace a dysfunctional government and/or limit the power of the financial Aristocracy at the ballot box, the nation is a democracy in name only.